Arlington, Virginia – Today, American Trucking Associations and ATA’s Share the Road highway safety program provide tips for safe driving ahead of Thanksgiving weekend. AAA projects more than 51 million Americans will travel more than 50 miles this Thanksgiving weekend, making this year the highest travel volume in over a dozen years. High traffic volume can contribute to congestion and a reduction in speeds. 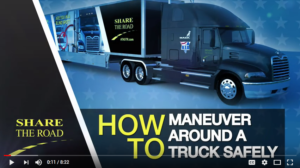 Share the Road’s Instructional Video spreads truck safety messages to the millions of motorists who will be driving alongside large trucks this week. The video, featuring professional truck drivers, gives an eight-minute recap of critical safe-driving habits and has already been viewed by hundreds of thousands of motorists, including truck drivers and the general motoring public. “The professional truck drivers in the Share the Road Instructional Video are highly-trained drivers who have accrued millions of accident-free miles. Just taking a few minutes to review some of these important safety messages can make all the difference on the road,” said ATA COO and Executive Vice President of Industry Affairs Elisabeth Barna. Thanksgiving offers several other driving challenges beyond traffic congestion. Winter driving presents unique problems for motorists, including high wind and blowing snow, which contribute to reduced visibility in many regions throughout North America. Similarly, freezing temperatures can have a profound impact on vehicles and the roadways. A thorough pre-trip inspection and understanding of driving conditions can play a significant role in driving success this holiday season. Buckle Up: A seat belt will not prevent a collision, but it will save a life. Remove ice and snow from your vehicle: Clear your windows and roof of snow to ensure you have maximum visibility and avoid creating a hazard for the vehicle behind you. Don’t allow ice and snow to create additional blind spots on your vehicle. Do not drive impaired: Driving is a great responsibility and your fellow travelers are relying on safe, attentive drivers to respectfully share the road and make good decisions. Be aware of truck blind spots: Trucks deliver your favorite Thanksgiving traditions – turkeys, cranberries, mashed potatoes and all kinds of tasty pies – so make it easy on them by staying out of blind spots. Pass on the left where the truck’s blind spot is much smaller. Keep your eyes on the road: Distracted driving is a major cause of traffic accidents and one of the leading causes of death amongst teenagers. Even just two seconds of distraction time doubles the chances of an accident. Use your cell phone when stopped and never text while driving. Do not cut in front of large trucks: Remember trucks are heavier and take longer to make a complete stop, so avoid cutting quickly in front of them. Fully loaded tractor-trailers can take the length of a football field plus both end zones to make a complete stop. Ask your favorite quarterback how far that is. Hint: it’s far. Prepare your vehicle for long distance travel: Before you head out to your aunts, uncles and cousins, check your wipers and fluids and have your radiator and cooling system serviced. Simple maintenance before you leave your home can prevent many of the problems that strand motorists on the side of the road. Prepare yourself for long distance travel: The vehicle needs maintenance and the driver needs plenty of rest and hydration to function at his or her best. If the turkey is making you feel drowsy, pull over and wait until you are more alert. Leave early and avoid risks: Leave early to reduce anxiety about arriving late. Road conditions may change due to inclement weather or traffic congestion. Be aware of the vehicle in front of you: Leave extra room between you and the vehicle ahead. Share the Road is a highway safety outreach program of the American Trucking Associations that educates all drivers about sharing the roads safely with large trucks. An elite team of professional truck drivers with millions of accident-free miles deliver life-saving messages to millions of motorists annually. The safety program is sponsored by Mack Trucks Inc., and supported by TA-Petro, Pre-Pass, Hyundai Translead, OmniTracs, SmartDrive, Mack Leasing, Bendix and Spireon. www.atastr.org.